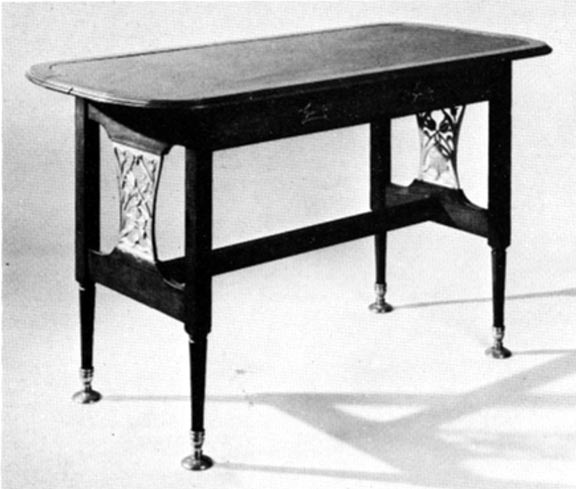 According to the Collector's Encyclopedia, William Arthur Smith Benson, "English architect and designer" whose furniture employed inlays of rosewood, tulip, and ebony, opened a "workshop for the production of turned metalwork on a commercial scale" in 1880 with encouragement from his friend William Morris for whose firm he had designed metalwork and furniture. He opened a factory three years later and then a showroom in Bond Street (not far from the Fine Art Society) in 1887. A founding member of the Art Workers Guild (1887), he wrote "Elements of handicraft and Design" (1893). He directed the Morris and Co. furniture departtment from 1896. Unlike others in the Arts and Crafts movement, he created designs "intended for machine mass production." Charlotte Gere points out that Benson not only designed furniture and metalwork for Morris and Co, he also "collaborated with J. H. Dearle on wall-paper designs" for the firm in the 1890s (Morris and Company, p.9). Morris and Company. Exhibition catalogue. London: The Fine Art Society with Haslam & Whiteway Ltd., 1979. Naylor, Gillian. The Arts and Crafts Movement: A Study of Its Sources, ideals, and influences on design theory. Cambridge: MIT Press, 1971. Random House Collector's Encyclopedia: Victoriana to Art Deco. NY: Random House, 1974; originally published in London by William Collins Sons in the same year with the title The Collector's Encyclopedia. W.A.S. Benson: Arts and Crafts Luminary and Pioneer of Modern Design. Ed. Ian Hamerton. Antique Collectors' Club, 2005.